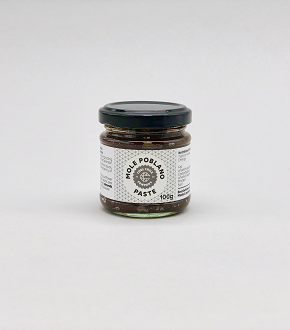 A rich savoury paste made with toasted dried chillies, dried fruit and cocoa. Water, sugar, nixtamalized corn flour, sunflower oil, Mexican dried chillies (10%) [pasilla and ancho], tahini paste (sesame), raisins, sea salt, cider vinegar, chocolate (3%) [cocoa nibs, sugar, almonds (nuts), cocoa powder, cinnamon], garlic, spices, cocoa powder. Dilute this sachet with 250ml of stock or water, then simmer, blend, and serve hot. Makes approximately 300ml sauce (enough for 3-4 as a main course or to make 8-10 tacos). Once opened, refrigerate and use with in 3 days. Please note that this item contains nuts and sesame. Dried black turtle beans, spices and epazote, to make Mexican style black beans and refry (recipe sheet included&nbsp;in pack).Mexican black beans, known as 'frijoles de la olla' are common to central and south Mexico, cook these beans with onion to make this dish, or add included sachet of smoked paprika to make refry.